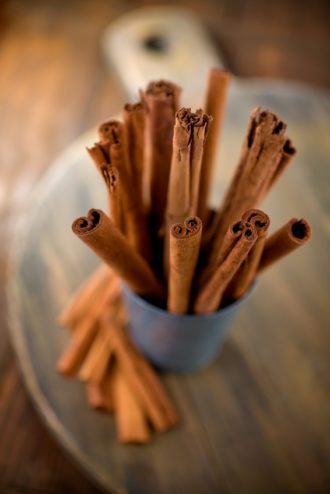 Its woodsy spice makes cinnamon a perfect wintertime cocktail ingredient. From infusing simple syrup to adding a pinch a shaken cocktail, bartenders across the country are showing off their affinity for this aromatic spice. Try it in one of these cinnamon cocktails. This frothy sipper from Jonathan Pogash combines wintertime flavors like blood orange and cinnamon with the Greek brandy, Metaxa. The classic daiquiri goes for a spicy spin with the addition of cinnamon syrup and a splash of Cognac. Cinnamon rides shotgun in this earthy and slightly sweet cocktail from Southern Wine & Spirits master mixologist, Bridget Albert. This wintry mix of mezcal and mulled cider gets an added boost from cinnamon syrup and a touch of citrus. Cinnamon-flecked hot chocolate gets a spirited lift from the addition of a coffee-flavored liqueur.